The spring steel tines vibrate with the forward motion, removing dead growth, aireating the soil and spreading manure. HAY TURNER – Used for drying hay and grass before collection. By removing the front tines and adjusting the angle, hay can be lifted and aireated quite quickly. In exercise areas a vibration and levelling action is achieved, leaving a smooth even surface. Use with Two Wheel Tractor. The exceptional manoeverability of a two wheel tractor is invaluable where difficult small areas need more than one pass, also it is possible to reverse the handles on most models, allowing access into tight corners to pull material away from the edges. Use (with implement carrier) for Garden Tractor, Quad Bike etc. The implement carrier allows use with garden tractors etc. The lift is operated manually from the drivers seat. Use with Four wheeled Small Tractor. 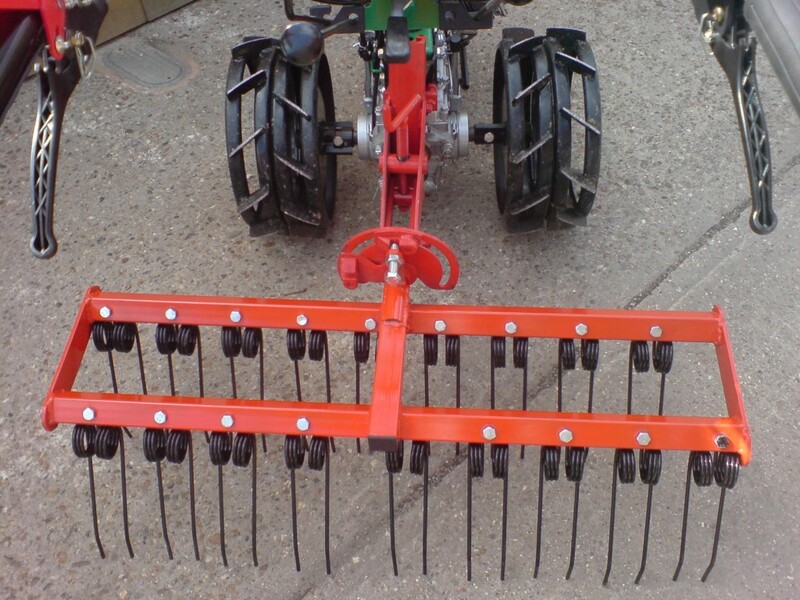 The harrow/rake can be fitted to small tractors, mounted on the three point lift. Two models are available:- Working width 1m – Price £294, Working width 1.2m – Price £335, Weight Tray Price £28 (optional) can be fitted to the standard tool carrier on all BSG two wheel tractors. For a Quad Bike or Garden Tractor the grass harrow can be supplied with a wheeled implement carrier (see picture gallery) – Price £234. This allows a Quad Bike or Garden Tractor to also use other implements such as ridgers, ploughs and levelling harrows etc.